I am seeing some preview issues when creating a loft while inside a group. If I'm in wireframe the preview of the loft fails completely (some lines flash and disappear when I press the preview button) or if I'm in OpenGL I get an unfilled wireframe preview. 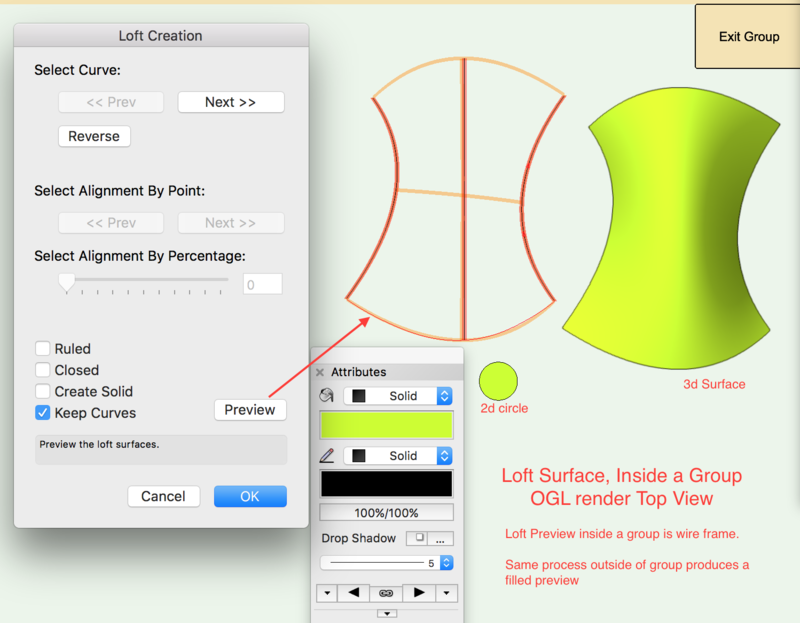 Working outside a group the loft previews as expected in both wireframe and OpenGL. Can someone else confirm this? Is this a known issue? Hi, Kevin - Confirmed all. Good catch! While testing grouped and ungrouped, I included a planar object with fill and a 3d surface with fill to indicate whether the view is rendered or wire frame. •If elements are not grouped, the preview is a lofted surface with color fill (OGL) or a wireframe (WF "render"). •Inside a group, the wireframe preview causes flashes, but no preview. Thanks for confirming. Your testing is thorough as always . It looks like it happens when editing/lofting within symbols too. @JimWis this a known issue? It doesn't look like it, moving and filing this now.